She tapped on my elbow again. After several prior physical therapy appointments, I knew this meant to relax. She didn't want me controlling my own reach. She wanted to see how far my shoulder could rotate up and sideways and back without the pestering pain. That pain was what brought me into the physical therapy room that morning and several other mornings in February and March. This particular morning she was evaluating my progress. She wanted to see if the massaging and stretching and pulling and prodding had loosened my shoulder and surrounding muscles and if my reach and rotation had improved. She measured and asked questions, like a post test. The pain was mostly gone but the reach and rotation was still less than normal. And she reminded me to relax my arm. Again. "You have trouble relaxing your arm. You must like to be in control over your own movements," she said. Oh do I ever like to be in control. Of my arm movements, yes, but so many other choices and timelines too. Like she taps on my elbow, I have to mentally tap myself. Yes, I have to remind myself to relax, but I'm doing better. I sat with a fiction book the other day. The kids were playing outside and the clean clothes just waited for me to fold them. I started to read "Missing You" by Harlan Coben. This morning started with a date with my husband. I didn't even look at my to-do list. We talked, laughed, ate breakfast at a restaurant, and enjoyed our spontaneous time together after the kids were off to school with my sister-in-law. I talked the other day with my daughter instead of rushing into the afternoon homework routine. I understood her in a new way because I didn't hurry. I left some dirty dishes in the sink after friends were over to watch basketball. I sat next to my husband on the couch and watched more basketball. And then last night we got in bed before 9 and watched an episode of "House of Cards." Yes, I had many different thoughts going through my mind, but I needed to be mentally done with the day instead of pushing myself to do one more thing. I schedule monthly massages because I need a physical reminder not to carry so much of life on my shoulders. At first I felt guilty, but I let go of that. Relaxing is part of my cure in laying down the idol named Productivity in my life. Curing perfectionism that seeks approval and and hoards replacement loves instead of Christ's love takes time because it's a process. 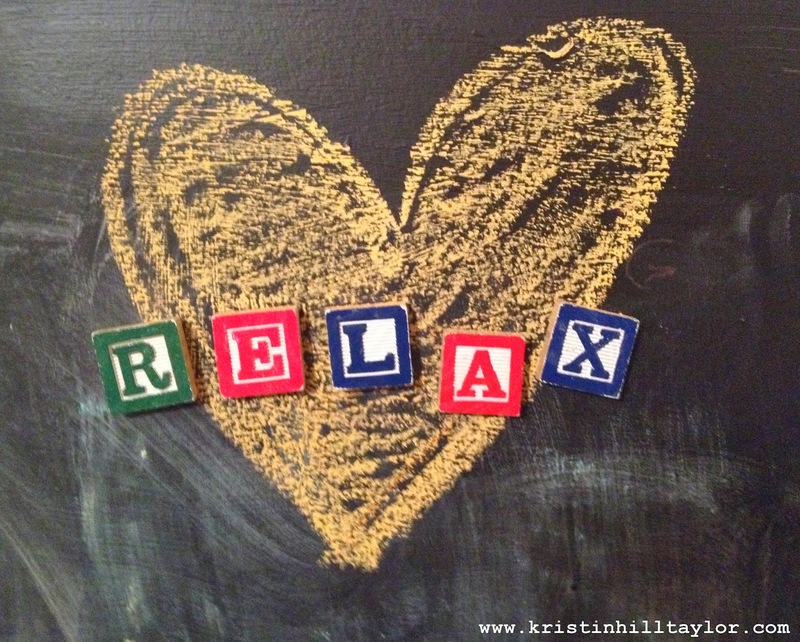 Like my shoulder is finding relief through the therapy, my heart is finding relief when I relax. It takes more than one appointment and some stretching, but I'm kinder and slower to anger this way. I'm seeing my daughter who is so much like me with more compassion when she talks about why recess was frustrating. I like life more when I free to enjoy it. It's the middle of the week. Frustrations may be mounting. Maybe you're weary. Perhaps you have too many things on your mind like I did yesterday. Whatever it is, loosen your grip. Do what you can, but know you can't do it all. Relax your shoulders, yes. Don't carry all the world's problems there. And relax your heart because from there everything else flows. I'm linking this post with two of my favorite encouragers: Holley Gerth, who hosts Coffee for your Heart, and Beth Stiff, who leads Three Word Wednesday. I'm also joining Lyli Dunbar for Thought-Provoking Thursday. I love this. What a sweet reminder to relax my heart body and soul. Thanks. :) Hope you're feeling better, Jenn! I was all smiles to see you joining us for Three Word Wednesday again! This really spoke to my heart this morning as I sit here frustrated that my entire right arm continues to be sore. And it begins at my shoulder. Maybe...I'm carrying too much. There is always so much on my mind. I'm headed to the doctor tonight and also looking forward to time to relax next weekend when I go visit my son and his wife and SAN DIEGO! Love you, friend. Thank you for how you are encouraging as you lay down your love idol. I had missed linking up with you! I sympathize with your arm pain. Mine has been long and drawn out and while there was a physical problem, it certainly paralleled a spiritual/emotional issue too. Let me know what you find out about it at the doctor. I'm so excited for you to be able to spend some time in San Diego with them - have a fantastic time!